Имате въпрос към P21 Chiang Mai Hotel? При посещение в Чианг Май, в P21 Chiang Mai Hotel ще се почувствате като у дома си, защото предлага квалитетно настаняване и отлично обслужване. Само на 0.5 km от градския център- това стратегическото местоположение на хотела гарантира на гостите си бърз и лесен начин за достигане до интересуващите ги точки на града. С удобното си местоположение хотелът предлага лесен достъп до всички градски забележителности, които задължително трябва да се видят. P21 Chiang Mai Hotel също така предлага много съоръжения за обогатяване на Вашия престой в Чианг Май. Докато са отседнали в този чудесен хотел, гостите могат да се насладят на безплатен WiFi достъп във всички стаи, 24-часова рецепция, съхраняване на багаж, Wi-Fi връзка в общите части, летищен трансфер. Гостите на хотела могат да изберат една от 21 стаи, в които се усеща атмосферата на спокойствие и хармония. Освен това в хотела можете да се възползвате от множество предложения за приятно прекарване на свободното време. P21 Chiang Mai Hotel е най-подходящото място за Вас, ако търсите качествен хотел в Чианг Май. Very nice location in Chiang-mai , just next to Tapae Gate. newly built hotel building with new room interior decoration. it is a very pleasant stay in this hotel and makes my trip in Chiang-mai unforgettable. Great corner room on top floor. Quiet place. Looks new. Location in alley but near more happening street. Not far from Tha Phae gate just outside old City. Only sampled bfast once, was ok but at 200 baht better choices nearby. I slept well here, be aware the mattress is firm Thai style not to everyone' s liking.. Also no elevator, but I already knew that. Recommended. The hotel located inside the alley. They do have motorbike rental at 250b for24 hrs. They provide 2 bottles of water, 2 cola & 2 orange juice daily. The receptionist girl is helpful & nice. Value for money & suggest to rent a bike to tour around Chiang Mai.. Else, be prepared to sweat during hot season. Definitely will be back for this hotel if wanna to stay near tha phae gate. Room was good sized, cozy and clean. The staff was friendly, helpful and spoke good English. My only complaint is that there is no elevator. after a long day of traveling, carrying my luggage up the stairs wasn't very enjoyable. They should have someone on staff to transport luggage for you. Hotel location was great, close to Phae Gate and walking distance to warorot market, night bazzar, Wat Chedi Luang etc. Staff was helpful. However the shower glass shield was too narrow which caused water easily leaked out to the floor outside, so I couldn't enjoy a shower without caution. The hotel also doesn't provide toothbrush set so if you forget to bring one you can't even buy one from the reception. On the other hand, the room has considerable amount of free drinks provided including 4 bottles of water, 2 box of juice and 2 cans of soft drink. Very useful for a day out under the Chiang Mai heat. 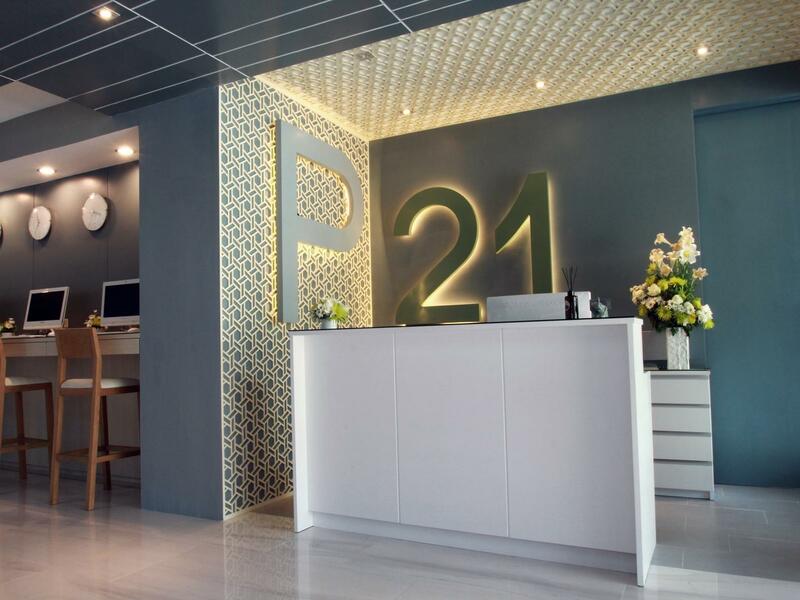 P21 is located very near the Tha Phae Gate, many restaurants, stores, the Sunday market, and about a 15 minute walk to the night market. The room included an in-room safe & a hair dryer, as well as toiletries which included a nice mint scented shampoo, conditioner, & shower gel, as well as soap, shower caps, and cotton buds. The 2 soda pops, 2 fruit juice boxes, and 4 bottles of water in the mini bar were all complimentary. Breakfast wasn't included with my room so I can't comment on the food. Guests need to be able to carry their luggage up stairs as there is no elevator. My standard room didn't include a kettle or tea & coffee supplies. When I asked the desk clerk for a kettle, she found me one alone with some tea and instant coffee. For the price of the room, this should have already been in the room. Overall, I had a good stay. great location near Thapae Gate and midway point to get to many places. hotel is on a quiet but safe backstreet (hotel has security guarding at night) that is easily accessed from the main road. very spacious room with a place to hang your clothes up, a small sofa on the side. bed is king sized and abit firm (like those massage mattresses) but still gives a comfortable sleep. I like that the room has power points left and right of the bed. some sound travels in from corridor but nothing that will disturb too much. I hope the hotel can consider for their next renovation a shower area that can be completely closed off, say with a glass door or shower curtain, as the current setup is not enough to prevent water from splashing out and wetting the floor unnecessarily. Overall, rooms are slowly showing signs of age with chipped paint and furniture edges, but other than that rooms are kept quite clean, and has a wonderful simple but modern aesthetic. Loved the location - it's in the old city, 2 mins walk to the Thapae gate but tucked away in a quiet alley so it's not noisy at all. The room is clean and decent, and the breakfast is yummy! All the staff were really friendly and helpful. If there's any concerns at all, this hotel has 4 storeys and no lift, so it may not be suitable if you are travelling with old folks. We stayed in this hotel for 4 days and we had a great experience. This hotel is just outside the Phae Gate, walking distance to Sunday Night Market and Night Bazaar. Room is big and clean. Staff are also very friendly, and they also provide several different free drinks everyday. I had a really great time there. The staff was really helpful recomended and booked the tours for me. The location is very centric, the hotel design is clean, simple and cozy! Loved the place.. I ll sure come back. I had a wonderful stay in this hotel. Newly renovated, the design is modern and fresh. The friendly and attentive staff from the reception to the kitchen is the gem of this place. This service level is definitely beyond a three star hotel. Great stay with the helpful staff. The location is so good, which is located at centre of the city and is convenient to go everywhere that you want, easily to call to taxi, tuk tuk or red car. Helpful staff who called "Aii" and "mindy" , they are so friendly and helpful and tried to help us to solve the problems that we raised. So thanks to them and appreciate their helping hand. Clean and elegantly designed interiors. Friendly and helpful hotel staff. Strategic location near Thapae gate! Never thought the location is so great to the old city and some others hotspot! Hotel is still new and clean, staff is very nice in helping, breakfast is also good! Definitely worth to visit again and we are planning tat too! Hope the 2nd visit will still the same quality....Really recommend! The location of hotel is central & superb. The hotel has no lift but the room is clean & tidy. The staff is nice & kind to give us tourist info. Hotel has provide motorbike rental service at 250 thai bath per day. 3 mins walk to mcd, 5 mins walk to Starbucks. Everything is satisfied, definitely will come back again for my next Chiangmai trip. Highly recommended hotel. Near to town. Simple nice design interior and tastefully decorate. Very attentiveand and intimate staff. We have a 17months old and they add on breakfast for him without any other charges. Breakfast is great especially local one, we can't have enough of their yellow and green curry! The only thing that is a little bit inconvenient is no elevator. The excellent service from the staff made my stay an amazing one. They go beyond their call of duties and offered help after their working hours. Thank you P21! Hotel located in the alley, very quiet at night, near Tha Pea Gate. Room sound proof are bad, can hear next room flush water sound even step sound. Hotel have no lift, if your room at level 3 and above, it will be very tired to climb. Basically, staff are less friendly, less smile on face. Overall are satisfactory only, can get a better hotel nearby with this price.